Moneck Payment Solutions has more features than what you ask for. Regardless where and how you operate your business, our cost and profit consultant can help you find the best merchant and payment solution for your business in your industry. Check out our industry low rate! 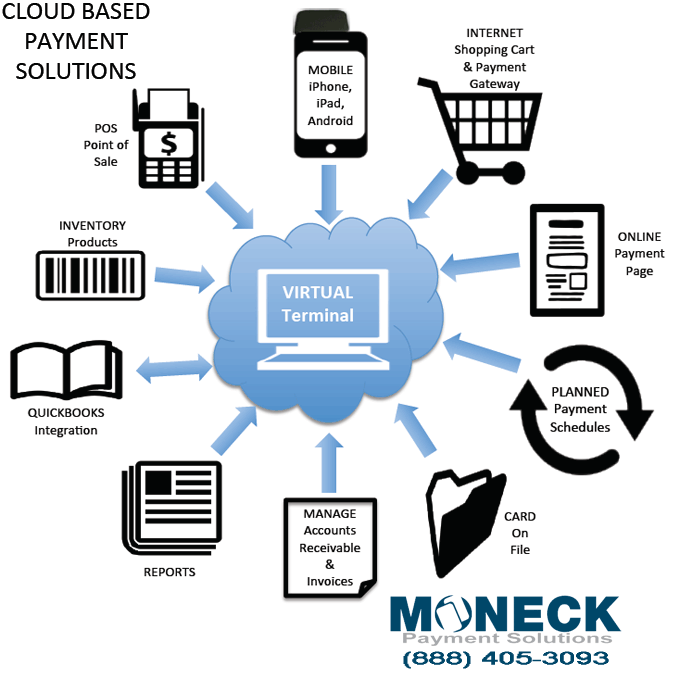 Moneck Payment Solutions is a cloud based payment architect. e-Commerce Payment Gateway - Process Internet website sale transactions, (i.e. Credit, and Debit cards) through your choice of shopping cart and payment gateway. Our premier payment gateway solutions for e-commerce include Authorize.net, Payeezy gateway, and the e-Processing Network. Virtual Terminal - Physically key in transactions from over the phone, from an agreement, from an invoice, or by mail order. Merchant can start processing credit card / debt card and e-check immediately after activate their merchant account with the processor. Wireless / Mobile Commerce - Process sales transactions wirelessly by using your iPhone, iPad, or Android device. Process and keep track of any payment transaction, (credit, debit, gift card, cash, and check). Physically key in transactions or swipe transactions using our (optional) card reader. Phone / Mail Order - Use any one of our payment gateways solutions to also physically key in transactions from over the phone, from an agreement, from an invoice, or by mail order. POS / Credit Card Terminals - Easily download and install our cloud-based Point-of-Sale software to any Windows-based operating system. Process and keep track of any payment transaction, (credit, debit, gift card, cash, and check). Physically key in transactions or swipe transactions using our (optional) USB card reader and Pin Pad. Recurring Payments - Provide repeat customers the convenience and speed of automatically charging their card on repeat purchases. Establish monthly, weekly, or bi-weekly recurring payment options for programs, products, and services. Quick Books Integration - Integrate all Web-based payment processing transactions directly into QuickBooks Pro, Premier, and Enterprise. Process real-time credit card and check transactions from within QuickBooks Pro, Premier, and Enterprise. Electronic Check Conversion - Save time and money with making trips to the bank, waiting in line, and paying staff to deposit checks. Instead, process checks electronically and receive funds in your merchant bank account typically within 24-48 hours. Electronic Invoice - Go paperless and save on postage. Brand your invoices and send them vial email. Your customer can click a pay link and enter their credit card information online and process their payment electronically. You receive notification of payment and receive funds into your merchant account. You can track payments through an online gateway. Inventory - Manage a perpetual inventory with minimal investment of time and money. Maintain information, and automatically adjust quantity as it is purchased. Compatible with our Payment Gateway, Internet Website Sales, POS software, and Mobile Processing. Custom Payment Solutions - Our merchant consultant can help you design and identify the best payment solutions for your unique business. Contact us to get started! Accepting credit card, debt card and e-check transaction with Moneck Payment Solutions have many benefits. This is not the end point of your profitable businesses, this is the beginning of your business growth. Ease of Use - Our system and virtual terminal are easy to use with many online tutorials. Upon setting your accounts, you can start processing transaction immediately. Affordability - We offer industry lowest possible rates to ensure your business is highly secured and profitable. Compatibility - Our payment gateway, virtual terminal and processor are compatible with most industry leading software and commercial shopping cart. Implementation & Configuration Support - We make available configuration support options when you select any one of our PCI Compliant gateway solutions. Security & Fraud Prevention - Our payment processor and systems currently offer the highest in security that include address verification (AVS) and fraud verification (CVN), which are the industry standards in fraud protection. With the highest levels of encryption and security protocols available in the industry you can be assured that your customer's data is secured. Next Day Funding - Receive you money the following business day. It is critical to receive your money promptly. End of Month Billing - Elect to pay the credit card processing costs all at once at the end of the month versus on a daily basis.One Point Billing - Save time and money by consolidating Visa, Master Card, Discover, and American Express into one merchant statement, and funding source. Customer Service - 24/7 Live customer support and a dedicated assigned merchant consultant to provide assistance and support. Online Reporting - Easily keep track and reconcile your credit card transactions daily. Reconcile and manage payment processing from anywhere the Internet is accessible. Free training and support. Business Quick Cash Advance - Easy access to working capital fund’s to enhance and grow your business.